Over the years, I have watched the Calabar festival on television without understanding it perfectly. I had to look closely and study and now I believe I know enough to prepare your hearts for the 2016 event. The month of December is usually a fun one in Cross River State because of the numerous tourist activities carried out. These put the state in a festive mode that is fully taken advantage of by its citizens and visitors alike. The December festivities are heralded by dry runs in previous months that give the people a foretaste of what to expect, and help the organizers by serving as a trial so they can plan effectively for the main event. This year, there was a beauty pageant in the month of November which brought in people from around the world. This gave a fore taste of the expectations for the last month of the year. From the first of December, a Christmas village is declared open, a place where people go to eat and drink, get things needed for the season and enjoy shows organized by different brands. Other activities are also organized at different locations, including music shows, comedy shows and a lot of other activities. Hotels in the state are always filled, accommodating people from within and outside the country who come in for the festivities. Intending visitors are advised to book online so they are sure of accommodation when they arrive. Fast food outlets are not left out, they enjoy constant influx of customers who troop in for their meals and meets. They also make good use of the opportunity by hosting events as well for customers and giving out freebies. The highpoint of the festivities is the street carnival which is termed Africa’s biggest street party, it holds on the streets of the ancient city. Cars do not move around on carnival days, people trek for miles without feeling a pinch, just to ensure their eyes are well-fed. Last year, at 12 midnight, the streets were still packed full and petty traders made lots of money selling water, sodas and snacks to onlookers waiting to see all the bands perform before retiring for the night. The festival bands are established groups which come up yearly to compete by making effort to interpret the chosen themes with their presentations - dance and costume. These bands have dancers who practice for months to make worthy presentations, escorted by others- Nigerians and foreigners- who join the bands for the roadshow, just like is done in other countries. · Passion 4 Band - This band usually comes out in green. · Masta Blasta Band – This band shows up in orange. · Bayside Band – This band reflects the water by showing up in blue. · Seagull Band – This group paints the town red. · Freedom Band – This is the group that comes out in yellow. 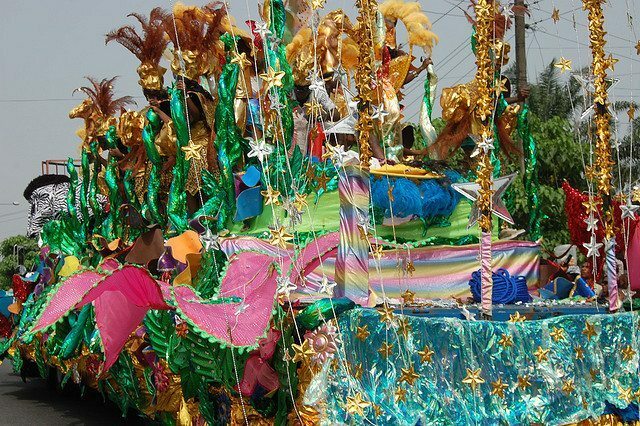 Hope to see you at the 2016 carnival, it promises to be exciting.